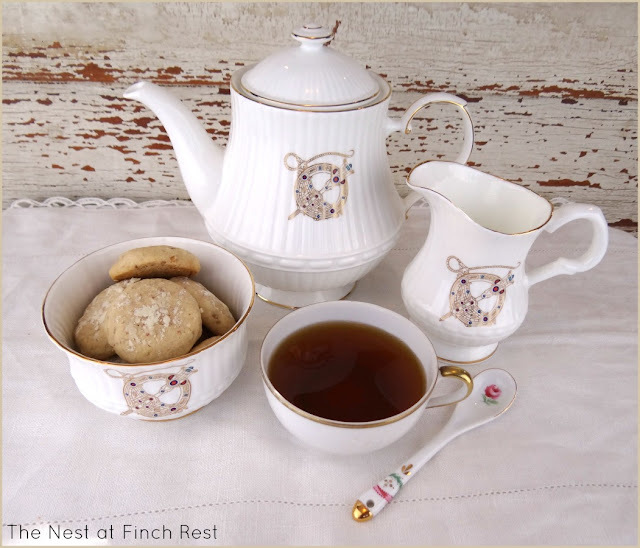 The Nest at Finch Rest: Beautiful Irish Tea Set Gift! 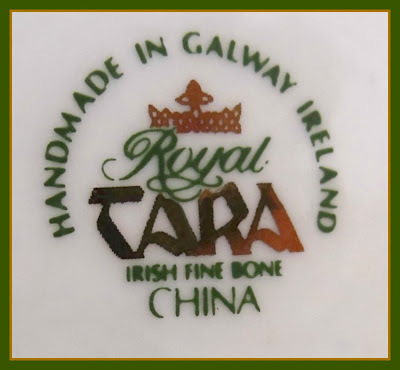 A Royal Tara Brootch of Ireland tea set! There are no words to describe how I feel about this extraordinary gift. I haven't quite found the words to properly thank her. 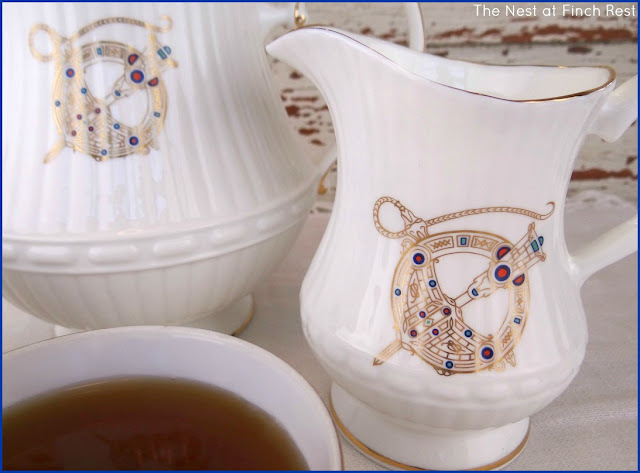 I LOVE LOVE LOVE THIS VERY SPECIAL TEA SET! consider her to be a "sister,"
were married three years ago. have Irish blood on both of my sides. She understands my love of my heritage. Just look what's on the bottom! she prefers strong black coffee to tea! gave me this amazing tea set. 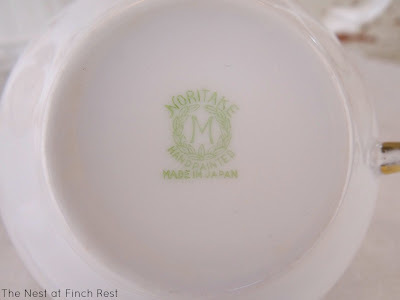 It came with lidded teapot, wide sugar bowl and a tall milk jug. is from an old set of Noritake teacups I have. my beautiful new tea set. I think I know who it's from! The Dowager Countess taking her tea. How many of you watched first episode of Season 3 yesterday? have been free and able to attend! costume party and Afternoon Tea, and then showed a special engagement screening of Season 3 Episode 1 on Saturday! By the time I heard about it it was all sold out. a proper Afternoon Tea because of it, and then I felt better. the better chance of local tea houses staying in business! this Christmas - and actually all year long! 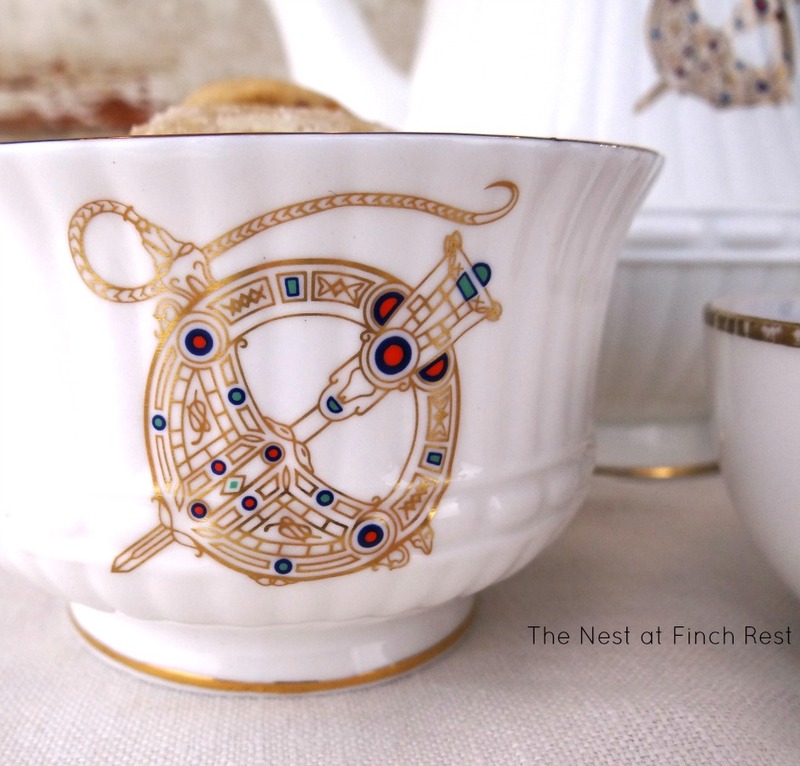 * Teacup Tuesday (Terri) * You're Gonna Love It! WHappy New Year, Michelle. What a wonderful gift! How very special! Something to treasure indeed. Watched Downton last night...and was not disappointed. Marvelous! What a beautiful gift! And -- just in time for the new season of Downton Abbey! Perfect! What fabulous Christmas presents, Michelle! Your new tea set is exquisite, and how special that "Santa" brought you the DVD's for Season I & II of Downton Abbey. I have a b-day coming up and that's what I'm asking my hubby for. I watched the first episode of Season III Sunday night. I love the idea of a costume party and Afternoon tea to kick-off the season premier. I didn't hear of any tearoom or hotel that did a special event in my area. What a special tea set. I bet that tea pot pours beautifully. Yes, I certainly did watch Downton Abbey. I have also read all spoilers. One might think that this would ruin it for me, but it doesn't. It, in fact, makes me more eager to see it. I bought the first two seasons for my daughter-in-law as we are the two in the family who love Downton Abbey best. I hope that she enjoys watching on some snowy weekend when the guys are out playing in the snow. A costume party? Be still my heart. You would have totally rocked a costume. Perhaps you can give one, instead. What a beautiful set, Michele! Of course we watched Downton Abbey!!!! We have been waiting for way too long...and the wait was finally over! Your new tea set is gorgeous! What a sweet and thoughtful gift. Now that is an awesome tea set! Your friend was indeed generous and kind in her choice of gifts. She certainly knows what you like! It is a beautiful set, and wonderful to have in your collection. I have watched the season three episode one two times already! I will likely watch it again this week too : ) I adore this series and am excited as to where the story lines are going to go. Wow! So fun you got two seasons for Christmas. I'm such a fan that I bought the third season in the UK format right after it finished in the fall in the UK. I saw the whole season long before Christmas. But that didn't stop me from tuning in again! Love your new tea set! What a wonderful gift! Oh- Thank you for finding me and commenting on my blog-now I found you back. I love your tea set-what a wonderful gift from a "sister" (in law)...lol...but NOT a sister-in-law. Don't you love our funny English phrases? I love Downton Abbey and was glued to the set Sun night. I just pre-ordered Season 3 from Barnes&Noble- member discount and free shipping...whooo hooooo~ I will have it by Feb 1st. What a treasure you have received! Very lovely indeed, Michele! Don't you just love it when someone special gifts you with an extraordinary gift? I sure do. I was given something very special for my birthday and I'm hoping to iron out this blog issue I'm having so I can share it with everyone. Thank you for sharing your lovely tea things and thank you for coming to tea. Happy New Year, my friend! That is a beautiful teaset! How sweet of Patricia to give you this treasure! I love Downton Abbey. Are you hooked yet? 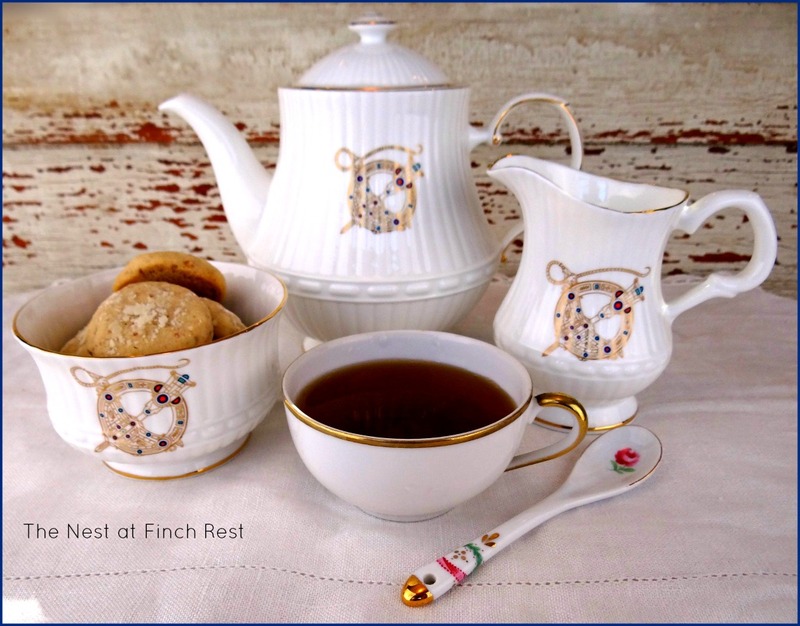 I'm sure she knows just how special you think she is, and how much you love the tea set. I have heard that lots of folks love those shows, but have never seen one myself. What a beautiful tea collection from your friend! Thanks for stopping in for a visit. Wishing you all the best in 2013! That is a beautiful tea set! I love Downton Abby and have watched them over & over again. Wonderful set Michele! It was really a very special gift. I am so happy for you. What a precious gift to receive!!!! It is absolutely a gorgeous one too and given with love. Perfect gift for you. I remember your Irish roots. I bet we get to see this again in March. You betcha we watched Downton. Wouldn't have missed it for the world. Loved Shirely McClaine and the role she played. Good foil for the Dowager. What a hoot. I would have loved to go to that tea as well. Boohoo for you. Perhaps you could host one??? So excited for your teaser!!! Going to see if I can look it up and dream about having one too. Micehel, what a thoughtful and beautiful gift from your friend. And Downtown Abbey, yup I love it! I own season one but haven't bought 2 yet. Hubby and I watch both 1 and 2 during the holidays. I was excited for season 3 to start. But oh, did you see that dark side of Bates? My kids gave me a gift set of Larkrise to Candlefor and I watched the entire thing again. Let's just say I've watched more T.V. in the last while than I have in a long time. I saw Nann tonight and told her 'hi' from you and that we MUST come visit some day. She said, "I would love to" Thanks for sharing your great gifts with Share Your Cup.